No need to fear checking out this new musical. 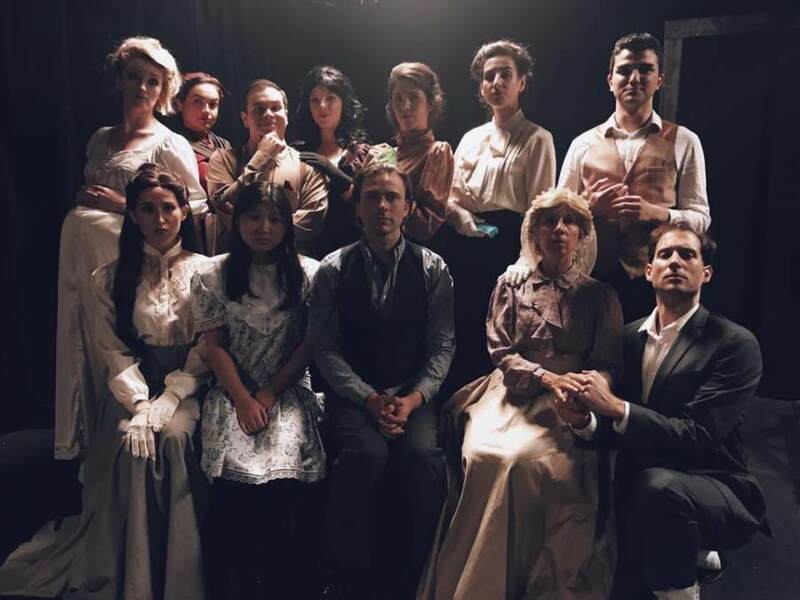 THML Theatre's production of Kit Goldstein Grant's Where Angels Fear to Tread presents E.M. Forster's novel in an entertaining emotional extravaganza. Directed by Kayla Friend, the musical begins with the recently-widowed 33-year-old Lilia Herriton (Maya Murphy) setting off from England on a trip to Italy with her chaperone Caroline Abbott (Theresa Egloff). She is seen off by her daughter Irma (Sarah Chiu) and her deceased husband's family, a cunning charismatic trio comprised of mother-in-law Mrs. Herriton (Nancy Magarill), brother-in-law Philip (James Stafford) and sister-in-law Harriet (Stephanie Hawkins). An intriguing story springs up among all these characters connected by the boring Victorian basic Lilia. Once in Italy, she marries Gino, a 21-year-old she has known for about five minutes, then is shocked that there are sides to him she has never seen before. She figures things will get better when she finds herself pregnant with his child. Back in England, Mother Herriton decides they need to salvage their reputations in England by sending Philip and Harriet to confront Lilia about this new life of hers. Caroline Abbott has her own opinions on how that should be handled, particularly when she learns that Lilia has died giving birth to a baby boy. The singing is pitch-perfect and the acting is excellent. All of the actors are present and on point, which made up a lot for the sparse set made up mainly of modern metal folding chairs, which distracted visually from the early 1900s setting. A scene where they all go to the opera is cleverly blocked in such a way that the audience sees both the opera as well as the characters' reactions while watching it. Stephanie Hawkins as the spoiled, willful Harriet is exceptional in her singing and acting, reminiscent of Emily Blunt's award-winning style. Nancy Magarill is perfect as Mrs. Herriton, the put-upon matriarch who honestly can't see how much she messed up her kids. Alexis Guarneros as Spiridione is hilariously expressive in all of his scenes. And James Stafford as Philip is a well-developed multi-faceted character instead of the stereotypical fop he could have so easily portrayed instead.